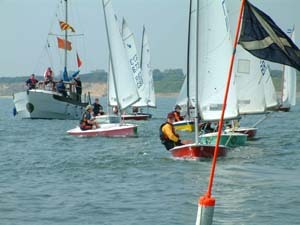 The Spalsh open meeting at Royal Norfolk and Suffolk YC took place over the weekend 31 May-1 June. The weekend started with a brilliant sunny day, with a breeze that stayed about Force 2 or less all day. An Olympic-type course was set, but as winds were so light the races were shortened to one lap. Jon Frary had a good start in the first race with James Large and Tim Frary close behind. James was first round the windward mark, followed closely by Tom Marfleet and David Jessop. All the boats started down towards the leeward mark and had to be redirected towards the wing mark , James reached this first with about a 50m lead from Chris Schonhut. The boats bunched up on the next leg towards the leeward mark, but James held off the competition and won from Tom Marfleet and Tim Frary. Adam Barker had a good start in the second race followed by Chris and Tom. However, James Large led by the windward mark, followed by Tom Marfleet with David Matthews in third. At the leeward mark the fleet had got mixed up with Dragons, Javelins and Squibs. James rounded followed closely by Tom and David. On the next leg David Jessop hit the windward mark, being carried onto the mark by the tide and had to do two turns. James Large won the the second race followed by Tom Marfleet and David Jessop. Race day dawned with a Force 2 south-easterly wind with poor visibility and the threat of thunder. The first race of the day started with a mad rush from the beach, since a rib was not on station until the 10-minute gun. James Large led most of the race from David Jessop. Conditions worsened for the fourth race with a heavy rain shower making things uncomfortable, with one gust up to Force 5. James Large again won the the race with David Jessop finishing second and Jonathan Frary third. The boats were brought in after this race since conditions were not improving.